The Ravi River (Punjabi: ਰਾਵੀ, Urdu: راوی‎, Hindi: रावी) is a transboundary river crossing northwestern India and eastern Pakistan. It is one of six rivers of the Indus System in Punjab region (Punjab means "Five Rivers"). The waters of Ravi are allocated to India under Indus Water Treaty. According to ancient history traced to Vedas, the Ravi River was known as Iravati (also spelt Eeraveti; Sanskrit: इरावती, परुष्णि) The Ravi was known as Parushani or Iravati to Indians in Vedic times and as Hydraotes (Ancient Greek: ’ϒδραωτης) to the Ancient Greeks. The Ravi River, a transboundary river of India and Pakistan, is an integral part of the Indus River Basin and forms the headwaters of the Indus basin. The waters of the Ravi River drain into the Arabian Sea (Indian Ocean) through the Indus River in Pakistan. The river rises in the Bara Bhangal, District Kangra in Himachal Pradesh, India. The river drains a total catchment area of 14,442 square kilometres (5,576 sq mi) in India after flowing for a length of 720 kilometres (450 mi). 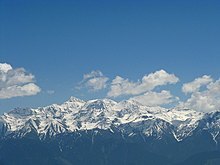 Flowing westward, it is hemmed by the Pir Panjal and Dhauladhar ranges, forming a triangular zone. The Ravi River originates in the Himalayas in the Multhan tehsil of Kangra district of Himachal Pradesh, India. It follows a north-westerly course and is a perennial river. It is the smallest of the five Punjab rivers that rises from glacier fields at an elevation of 14,000 feet (4,300 m), on the southern side of the Mid Himalayas. It flows through Barabhangal, Bara Bansu and Chamba districts. It flows in rapids in its initial reaches with boulders seen scattered in the bed of the river. The Ravi River in this reach flows in a gorge with a river bed slope of 183 feet per mile (34.7 m/km) and is mostly fed by snow melt, as this region lies in a rain shadow. Two of its major tributaries, the Budhil and Nai or Dhona join 64 kilometres (40 mi) downstream from its source. 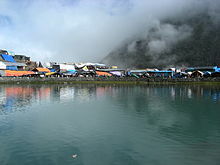 The Budhil River rises in Lahul range of hills and is sourced from the Manimahesh Kailash Peak and the Manimahesh Lake, at an elevation of 4,080 metres (13,390 ft), and both are Hindu pilgrimage sites. The entire length of Budhil is 72 kilometres (45 mi) where it has a bed slope of 314 feet per mile (59.5 m/km). It flows through the ancient capital of Bharmwar, now known as Bharmour in Himachal Pradesh. During 1858–1860, the Raja of Bharmour had considered the Budhil valley as an excellent source of Deodar trees for supply to the British Raj. However, a part of the forest surrounding the temple was considered sacred and declared a reserved area. The second tributary, the Nai, rises at Kali Debi pass, and flows for 48 kilometres (30 mi), with a bed slope of 366 feet per mile (69.3 m/km), from its source at Trilokinath to its confluence with the Ravi. This valley was also exploited for its forest wealth during the English period. Tant Gari is another small tributary that rises from the subsidiary hill ranges of the Pir Panjal Range east of Bharmour. The valley formed by this stream is U-shaped with a river bed scattered with boulders and glacial morainic deposits. The main Ravi River flows through the base of Dalhousie hill, past the Chamba town. It is at an elevation of 856 metres (2,807 ft) (where a long wooden bridge existed to cross the Ravi River). It flows into the south-west, near Dalhousie, and then cuts a gorge in the Dhauladhar Range, before entering the Punjab plain near Madhopur and Pathankot. 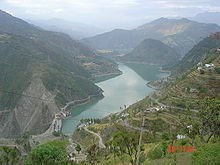 It then flows along the Indo–Pak border for 80 kilometres (50 mi) before entering Pakistan and joining the Chenab River. The total length of the river is about 725 kilometres (450 mi). Ujh River is another major tributary of the Ravi River. Its source is in the Kailash mountains at an elevation of 4,300 metres (14,100 ft), close to the Bhaderwah Mountains in Jammu district. After flowing for 100 kilometres (62 mi), it joins Ravi at Nainkot in Pakistan. As the Ravi flows past Lahore in Pakistan (26 kilometres (16 mi) below Amritsar in India) it is called "The river of Lahore" since that city is on its eastern bank. After passing through Lahore the river takes a turn at Kamlia and then debouches into the Chenab River, south of the town of Ahmadpur Sial. On its western bank is the town of Shahdara Bagh with the tomb of Jahangir and the Tomb of Noor Jahan. According to satellite imagery studies carried out over a period of 20 years (between 1972–1973 and 1991–1993), the river coursing along the India–Pakistan border meanders substantially in the alluvial plains of the Amritsar, pathankot and Gurdaspur districts of Punjab. This has resulted in successive damage in the Indian Territory as a result of the river changing its course towards India. 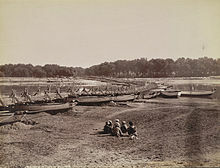 The reason attributed to this change in the course of the river is massive river training structures/bunds constructed by Pakistan in its part of the river, close to the old course of the river. The shift in the course of the river is reported to be 4.8 kilometres (3.0 mi) towards India. In the trans-boundary Ravi River flowing from India to Pakistan, in urban areas of Lahore the pollution levels in the river discharge are reportedly very high, which is attributed to careless disposal of large amount of industrial and agricultural waste water and faulty drainage systems in both countries. A 72-kilometre (45 mi) stretch of the Ravi River from Lahore Siphon to Baloki headworks indicates heavy contamination of the water and sediment with Cd, Cr, Pt and Cu. The river sediments are highly contaminated and have become secondary source for pollution of the river water, even though some control over unauthorised discharges into the river have been checked. Hence, measures to check metal re-mobilization from sediments into the river flows needs attention. The worst affected drainage is the Hadharaam drain, a tributary of the Ravi River. It is also a trans-border problem involving both India and Pakistan. A UNDP funded a special programme was launched in 2006 to address the issue in both countries. The Ravi valley in its upper reaches has Deodar, walnut, Quercus ilex, mulberry, alder, edible pine (Pinus gerardiana), twisted cypress (Cupressus torulosa), chinar (Platanus orientalis), daphne papyracea, cedrela serata, and sisso, olive and kakkar (raus). The waters of the Ravi River are allocated to India under the Indus Waters Treaty, signed by India and Pakistan. Within India, the river is under the jurisdiction of the riparian states of Punjab and Himachal, and non-riparian states of Haryana, Jammu & Kashmir and Rajasthan, but the management is presided by the Supreme Court of India and the Ravi Beas Tribunal, set up in 1986 for the purpose. On the Ravi River, the earliest project built was the Madhopur Headworks, in 1902. It is a run-of-the river project (no storage envisaged) to divert flows through the Upper Bari Doab Canal (also known as Central Bari Doab Canal) to provide irrigation in the command area of the then unified India. [a] Government of India has assessed the pre-partition use in India (Punjab) at 1.821 cubic kilometres (1,476,000 acre⋅ft). Prior to partition, it irrigated 335,000 hectares of land in Gurdaspur, Amritsar and Lahore districts. The Hydropower potential of Ravi River system has been assessed at 2294 MW. The hydropower potential developed since the 1980s is through installation of Baira Suil Hydroelelectric Power Project of 198 MW capacity, the Chamera-I of 540 MW capacity commissioned in 1994, the Ranjitsagar Multipurpose Project (600 MW) completed in 1999 and the Chamera-II of 300 MW capacity in the upstream of Chamera-I commissioned in 2004. As the Ravi river is located at lower level, Indus, Jhelum and Chenab rivers water can be diverted to this river for harnessing huge hydro power potential. The major multipurpose project (Irrigation, Hydropower, Flood Control, development of Fisheries, Tourism and so forth) built on the river is the Ranjit Sagar Dam (also known as Thein dam as it is in Thein village). The left bank is in Punjab and the right bank is in Jammu and Kashmir. It is located on the main stem of the Ravi River, about 24 kilometres (15 mi) upstream of Madhopur Headworks (built during pre-partition time). The project is an outcome of the development plan conceived for the use of the waters of three eastern rivers allocated to India under the Indus Treaty, namely the Sutlej, the Beas and the Ravi, for irrigation, hydropower generation and other consumptive uses. A proposal for building a storage dam on the Ravi River was initially planned in 1912, envisaging a 61 metres (200 ft) high dam. A committee later conducted a survey of the area, but it was not until 1954 that geologists fully inspected the project area. In 1957, a storage Dam was proposed on the Ravi River for irrigation purposes only. The power generation aspect was not considered then. It was only in 1964 that the project was conceived for multipurpose development and submitted to Government of India for approval. Finally, in April 1982, the project was approved for construction by the Government of India. The project, as built now, has a 160-metre (520 ft) high earth gravel shell dam with a gross irrigation potential of 348,000 hectares (860,000 acres) of land and power generation of 600 MW (4 units of 150 MW capacity each). The Indus System of Rivers comprises the three Western Rivers in the Indus, the Jhelum and Chenab together with three Eastern Rivers; the Sutlej, the Beas and the Ravi. To establish the ownership of these waters, an Indus Water Treaty was signed between India and Pakistan on 1 April 1960, under monitoring of the World Bank. The treaty, under Article 5.1, envisages the sharing of waters of the rivers Ravi, Beas, Sutlej, Jhelum and Chenab which join the Indus River on its left bank (eastern side) in Pakistan. According to this treaty, Ravi, Beas and Sutlej, which constitute the eastern rivers, are allocated for exclusive use by India before they enter Pakistan. However, a transition period of 10 years was permitted in which India was bound to supply water to Pakistan from these rivers until Pakistan was able to build the canal system for utilisation of waters of Jhelum, Chenab and the Indus itself, allocated to it under the treaty. Similarly, Pakistan has exclusive use of the Western Rivers Jhelum, Chenab and Indus but with some stipulations for development of projects on these rivers in India. Pakistan also received one-time financial compensation for the loss of water from the Eastern rivers. Since 31 March 1970, after the 10-year moratorium, India has secured full rights for use of the waters of the three rivers allocated to it. The treaty resulted in partitioning of the rivers rather than sharing of their waters. Even prior to the partition of India in August 1947, India had developed projects on the river Ravi and Beas River system. When the treaty was under debate, India had taken advance action to develop the three rivers, which were eventually allocated to it under the treaty. According to a directive of the Government of India, planning for development of the Ravi and Beas rivers was initiated concurrently with the treaty negotiations, which involved four riparian states of Punjab, PEPSU (this was merged with Punjab and subsequently Punjab was divided, and additionally the Haryana state was created), Himachal Pradesh, Rajasthan and Jammu and Kashmir (J&K) within the ambit of the already developed Bhakra Nangal Dam project on the Sutlej River. A review of the flows in the two river systems revealed that prior to partition of the country and up to the time of the signing of the Indus Treaty, 3.86 cubic kilometres (3,130,000 acre⋅ft) of water was used by major irrigation systems such as the Upper Bari Doab Canal System (1959) and the Lower Bari Doab Canal System (1915). The unused flow in the two river systems was assessed at 19.22 cubic kilometres (15,580,000 acre⋅ft), which was planned to be developed by the four states of J&K, PEPSU, Punjab and Rajasthan. However, with the merger of PEPSU with Punjab and subsequent bifurcation of Punjab into two states, a dispute arose on the allocation of Ravi and Beas waters for which a tribunal was set up under the Interstate River Water Disputes Act. As a counter claim to the exclusive claims of Punjab, Haryana claims that a small part of Haryana state lying north in Panchkula district is part of Sutlej river basin area in addition to Punjab and Himachal Pradesh in India. Thus Haryana claims to be a riparian state of Indus river basin. Share of Punjab 4.22 million acre-ft (MAF); Share of Haryana 3.50 MAF ; Share of Rajasthan 8.60 MAF; Quantity earmarked for Delhi Water supply 0.20 MAF; Share of Jammu & Kashmir 0.65MAF with some specific provisions. The farmers of Punjab, Haryana and Rajasthan will continue to get water not less than what they are using from the Ravi Beas system as on 1.7.1985. Waters used for consumptive purposes will also remain unaffected. Quantum of usage claimed shall be verified by the Tribunal referred to in paragraph 9.2 below. 9.2 The claim of Punjab and Haryana regarding the shares in their remaining waters shall be referred for adjudication to a Tribunal to be presided over by Supreme Court Judge. The decision of this Tribunal will be rendered within six months and would be binding on both parties. All legal and constitutional steps in this respect to be taken expeditiously; 9.3 The construction of Sutlej Yamuna Link (S.Y.L.) canal shall continue. The canal shall be completed by August 1986. Punjab has not allowed the construction of the SYL and will not allow it ever. All river waters in the world are allocate on the basis of riparian law, however in this case a grave injustice is being done to Punjab. As stated above J&K has started utilizing Ravi water and does not need Punjab s consent. Punjab needs to implement the same formula of utilizing water for its exclusive usage instead of letting it flow to Haryana and Rajasthan who instead of being thankful to Punjab have started demanding its share as well. Punjab is contemplating to construct 206 MW Shahpurkandi dam project hydro electric project on the Ravi river between Ranjitsagar dam and Madhopur head works. This stretch of the river is forming boundary between J & K state and Punjab state. Since Punjab had unilaterally exited from the earlier water sharing agreements, J & K state refused the project construction. Also J & K state is going ahead with the construction of Ravi canal originating from Basantpur to irrigate 54,000 hectares (133,000 acres) of land in Jammu region. This canal would draw river water by pumping the water released downstream from the Rangitsagar reservoir for which J & K state is not required to take consent from Punjab as it is not bound by earlier river water sharing agreements. Transfer of surplus water from one basin to another, termed as interbasin water transfer has been effectively implemented on the Ravi River. The surplus waters of the Ravi River have been transferred directly first to the Beas River through the Ravi-Beas Link. A further link from Beas River to the Sutlej River by the Beas Sutlej Link augments storage of the Bhakra reservoir in India. Wikimedia Commons has media related to Ravi River. ^ Doabas formed by the Ravi River are known as the Rechna Doab – between the Chenab and the Ravi River, and the Bari Doab or Majha – between the Ravi and the Beas River. ^ a b c d "Ravi River". Encyclopædia Britannica. Retrieved 11 April 2010. ^ Hastings, James (2003). Encyclopedia of Religion and Ethics, Part 18. Kessinger Publishing. p. 605. ISBN 0-7661-3695-7. Retrieved 14 April 2010. ^ Medieval Indian Literature: Surveys and selections. Sahitya Akademi. p. 71. ISBN 9788126003655. Retrieved 27 March 2017. ^ Modi, Sir Jivanji Jamshedji (1954). The influence of Iran on other countries. K.R. Cama Oriental Institute. Retrieved 27 March 2017. ^ Journal of the Royal Asiatic Society of Great Britain & Ireland Volume 6. Cambridge University Press for the Royal Asiatic Society. 1841. p. 369. Retrieved 27 March 2017. ^ Ahsan, Aitzaz (2005). The Indus Saga. Roli Books Private Limited. ISBN 9789351940739. ^ a b c Jain, Sharad.K. ; Pushpendra K. Agarwal; Vijay P. Singh (2007). Hydrology and Water Resources of India. Springer. pp. 481–484. ISBN 1-4020-5179-4. Retrieved 14 April 2010. ^ "Executive Summary of Environmental Impact Assessment Report Bajoli Holi H. E. Project (180 MW)Chamba, Himachal Pradesh" (PDF). R. S. Envirolink Technologies Pvt. Ltd. 2010. p. 18. Retrieved 1 September 2014. ^ a b Cleghorn, H. (2001). Report upon the forests of the Punjab and the Western Himalaya. Ravi River. Indus Publishing. pp. 109–112. ISBN 81-7387-120-5. Retrieved 14 April 2010. ^ a b c "Ravi River in Himachal". Himachal World.com. Retrieved 14 April 2010. ^ Thomas, Abraham; Sharma, PK (1998). "The shift of ravi river and the geomorphological features along its course in amritsar and gurdaspur districts of punjab". Journal of the Indian Society of Remote Sensing. 26: 57. doi:10.1007/BF03007340. ^ a b "Pakistan, India Join Hands to Clean Canal". River Basin Initiative. Archived from the original on 24 July 2011. Retrieved 18 April 2010. ^ "Base Line set up of the area" (PDF). Satlu Vidyut Nigam Ltd. Archived from the original (pdf) on 16 July 2011. Retrieved 14 April 2010. ^ Dr. Mohinder Kumar Slariya. "The Other Side of Hydroelectric Power Development:-A Study of NHPC Owned Power Projects" (PDF). Government PG College, Chamba Himachal Pradesh. Archived from the original (pdf) on 24 August 2009. Retrieved 14 April 2010. ^ "Harnessing gigantic hydro power potential of Indus, Jhelum and Chenab rivers in India". Retrieved 30 November 2017. ^ a b "Ranjit Sagar Dam (Hydro Electric Project) 4 X 150 MW". Punjab State Electricity Board. Archived from the original on 2 May 2008. Retrieved 15 April 2010. ^ "Information on some major projects". Ranjit Sagar Dam. Central Water Commission: National Informatics Centre. Archived from the original on 8 March 2010. Retrieved 14 April 2010. ^ a b "Punjab". Irrigation. India.gov.in. Archived from the original on 10 April 2010. Retrieved 14 April 2010. ^ The Indian geographical journal, Volume 60. Indian Geographical Society. 1985. p. 188. Retrieved 14 April 2010. ^ a b "The Indus waters Treaty A South Asia Program". Stimson.org. Archived from the original on 8 August 2009. Retrieved 14 April 2010. ^ "Water Sharing Conflicts Between Countries, and Approaches to Resolving Them" (PDF). Honolulu: Global Environment and Energy in the 21st century. p. 41. Archived from the original (pdf) on 21 August 2007. Retrieved 14 April 2010. ^ Garg, Santosh Kumar (1999). International and interstate river water disputes. Laxmi Publications. pp. 54–55. ISBN 81-7008-068-1. Retrieved 14 April 2010. ^ "Water Sharing Conflicts Between Countries, and Approaches to Resolving Them" (PDF). Honolulu: Global Environment and Energy in the 21st century. p. 98. Archived from the original (pdf) on 21 August 2007. Retrieved 14 April 2010. ^ "War over water". Guardian. 3 June 2002. Retrieved 14 April 2010. ^ "water sharing Conflicts within Countries" (PDF). Honolulu: Global Environment and Energy in the 21st century. 2004. Archived from the original (pdf) on 26 April 2012. Retrieved 14 April 2010. ^ "Wet lands of Haryana state (page 27)" (pdf). GoI. Retrieved 27 November 2012. ^ "River Water Disputes". Government of India. Retrieved 14 April 2010. ^ "Shahpur kandi HEP – PSPCL". Archived from the original on 17 January 2013. Retrieved 23 April 2013. ^ "Punjab Loses Teeth, J&K Gets a Canal – Free Press Kashmir". 23 April 2013. Archived from the original on 31 May 2013. Retrieved 23 April 2013. ^ "Agreement between Punjab and J&K on Ranjit Sagar Dam, etc" (PDF). 1979. Retrieved 23 April 2013. Indian climate change from Harappa period. Cleghorn, H. (2001). Report upon the forests of the Punjab and the Western Himalaya. Ravi River. Indus Publishing. pp. 109–112. ISBN 81-7387-120-5. Retrieved 14 April 2010. Garg, Santosh Kumar (1999). International and interstate river water disputes. Laxmi Publications. pp. 54–55. ISBN 81-7008-068-1. Retrieved 14 April 2010. Jain, Sharad.K. ; Pushpendra K. Agarwal; Vijay P. Singh (2007). Hydrology and Water Resources of India. Springer. pp. 481–484. ISBN 1-4020-5179-4. Retrieved 14 April 2010. The Indian geographical journal, Volume 60. Indian Geographical Society. 1985. p. 188. Retrieved 14 April 2010.